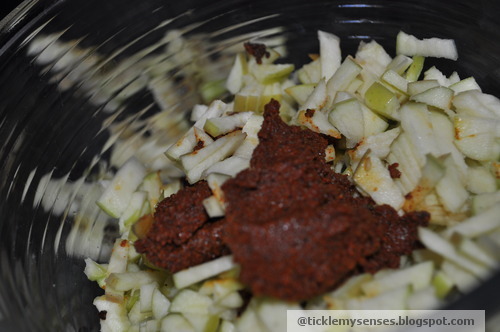 Tickle My Senses: Wickedly Delicious- Minced Green Apple Pickle ! This summer our 3 year old hybrid apple tree gave us our first big crop. 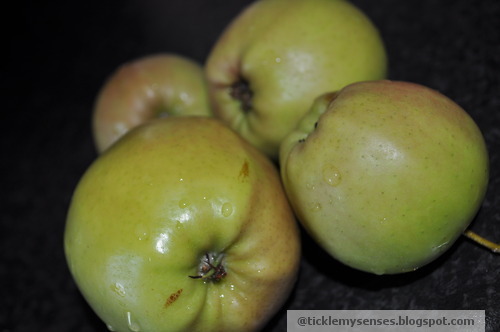 A lovely mix of golden delicious, red apples and green granny smith apples. 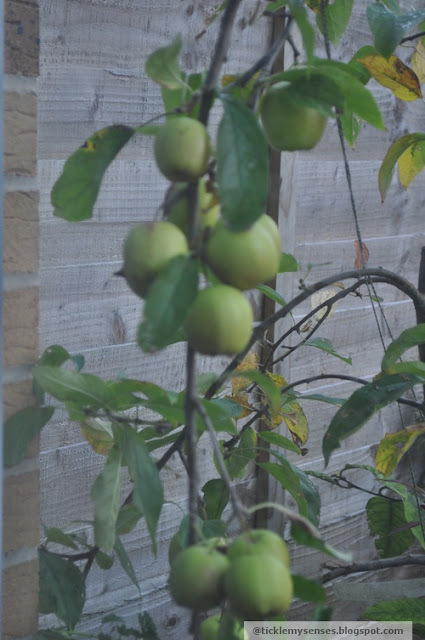 Determined not to let any apples go to waste hubby and me set out to pickle the green granny smith apples in my very own spice mix...the other 2 varieties went into an apple pie and an apple cake. 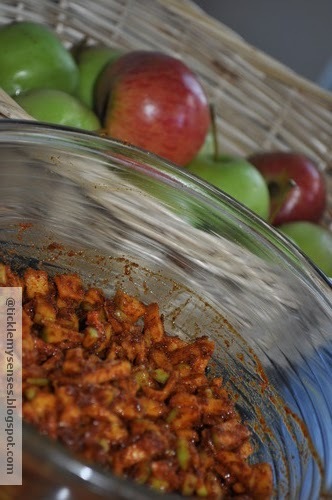 This pickle recipe is a quick one, it involves frying and grinding a few spices, then adding it to the minced apples. This pickle can be eaten the same day, a few hours after the pickle is made, and should be refrigerated and consumed within a week. 2. Add cayenne pepper/ chilli powder, paprika, salt and vinegar to the ground/ pounded mixture. Mix well . Keep aside to cool. 3. 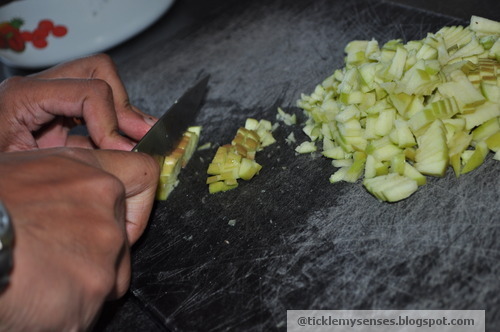 Meanwhile finely dice the apples on a dry and clean chopping board. 4. 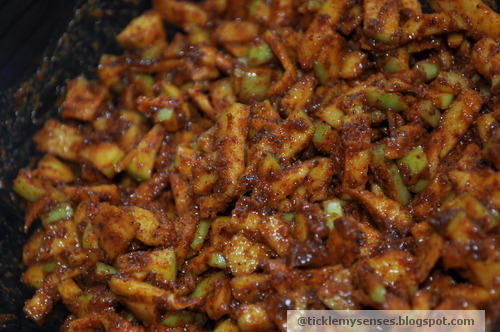 Mix the diced apples well with spice paste using a clean wooden spoon. Fill the prepared pickle into clean sterilised jars and keep in the refrigerator. Can be eaten same day. Best used within a week. 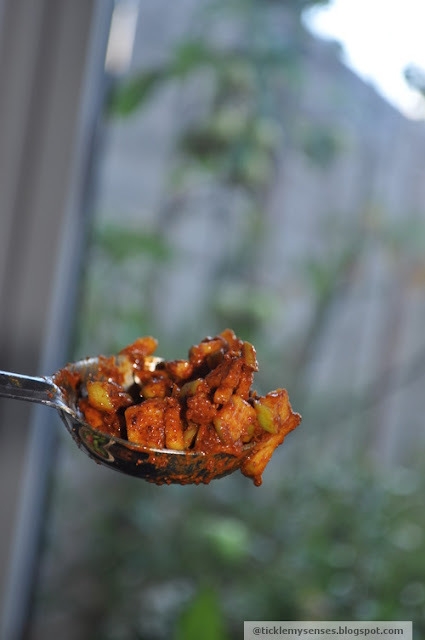 Tiny bites of sweet, tart and crunchy apples in a simple spice mix, that is wonderfully hot and and mouth wateringly tasty, here is to the apples in a refreshing and wicked new avatar. 1.Make sure apples are washed and dried well before dicing. 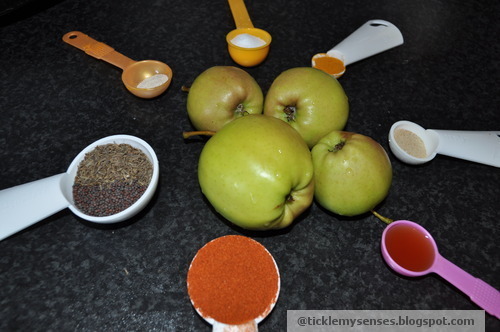 Dice the apples only once the spice mixture is ready or else they will discolour. 2. Place the pickle in a sterilised glass jar. To sterilise a clean jar, place in an heated oven on middle shelf at 180C for 20 minutes. Be careful while handling hot glass jars. Once the jar has cooled completely, fill with the prepared pickle and close the lid tight. 3. Always use a clean dry spoon to take pickle from the jar. Ensure the remaining pickle in jar is levelled off and is always covered with a layer of oil.